Used Mercedes trucks are always a good choice for logistics companies. Even in 2017 there are still a lot of pre-2000’s Mercedes tractorheads driving around. Moreover, we sell many used Mercedes trucks with more than a million kilometres on the clock. The reason is simple: used Mercedes trucks are decent, reliable and valuable! The Mercedes-Benz company is very famous for making high quality cars and trucks. Take a look at our large stock of used Mercedes tractorheads. We guarantee there is always a perfect Mercedes truck for you! Did you see an interesting Mercedes truck or Mercedes tractorhead on our site? Please contact us via our contact form or call us. Our professional employees are happy to tell you everything about the used Mercedes truck that you may want to buy. We also offer the opportunity to arrange transport for your truck. BAS Trucks has a special shipping department which can organize the shipment of your used Mercedes truck. Besides used Mercedes trucks, we also sell new Mercedes trucks. Most of these trucks and tractorheads are in (almost) new condition, ranging from registration years 2014-2016. BAS Trucks also offers truck leasing programs for its customers in 14 European countries, so that provides your transport company the perfect solution for buying a new Mercedes truck! 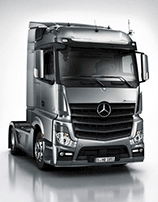 The Mercedes Actros is by far the most sold Mercedes truck model. It is generally being used for both exceptional transport and long-distance transport. 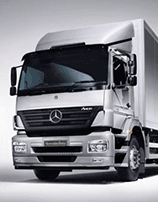 A Mercedes Actros truck is known for being extremely economic. It saves loads of fuel compared to similar trucks. Because of its heaviness and multifunctionality, many logistic companies use this truck both for use at building sites and for use at international transport. The Mercedes Axor is one of the best trucks for mid-long distances. An Axor truck scores high when it comes to functionality, design, comfort and power. The truck cabin is also very functional and the seats are ergonomically designed, which prevents neck- and back injuries. If your transport company is mainly focused on national or small international transport, a used Mercedes Axor would be a perfect choice.